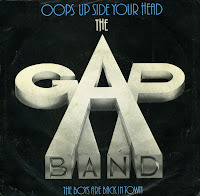 'Oops upside your head' is a 1979 funk track recorded by the Gap Band. It was the lead single from their third album, 'Gap Band'. This single became an international hit for the group upon its late 1979 release, though it failed to reach the US Billboard Hot 100. The song mainly features humorous spoken monologues by Gap Band lead singer Charlie Wilson, who was inspired by his cousin Bootsy Collins' own humorous slant in his songs. The song is said to be one of the first songs to use hiphop-styled monologues in a song. When it came out, I hated this song, preferring the Gap Band's next single, 'Burn rubber'. Somewhere in the Nineties, I actually started to like it, preferring it to even worse hiphop tracks that were so prominent at that time. But I've come full circle: I hate it again. But the B-side is a nice song. When the Gap Band hit the charts in 1980 with 'Oops upside your head' I found it at least an irritating song. My sister liked it, and to my disgust she actually bought the single too. To me, it was a bunch of people talking and laughing over what should be a good tune. Later in life I would learn this is the nature of hiphop - a music style I would never get into. The next year things went just the other way around: 'Burn rubber' was a tune I really liked, while my sister couldn't understand what attracted me to this. I felt the guys had learnt to sing somewhat, and on the whole it had more of a song structure. I bought a copy of the song - obviously to my sisters disgust. 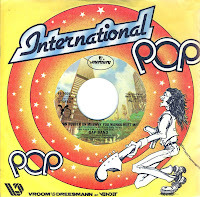 My brother managed to talk me out of the custom Mercury sleeve - so now I'm stuck with a standard 'Vroom & Dreesman' sleeve for this single, manufactured at that time by the Dutch warehouse of the same name.